We had just finished deciding on where we would pile it when he asks me the inevitable question, the question with no satisfactory answer, the answer to which he really doesn’t want to hear… So, just how much manure do I need? Oh, I’ll take as much as you will get me. 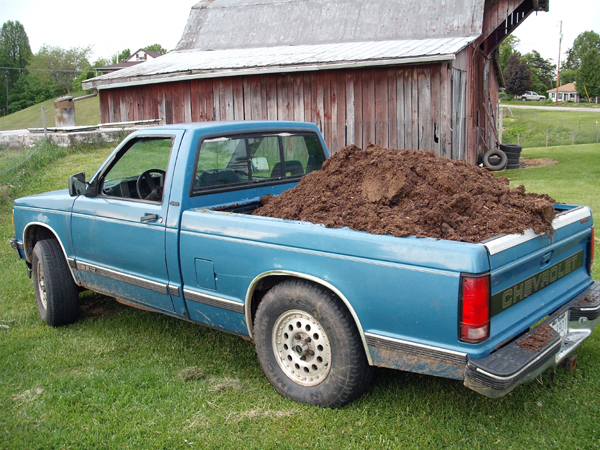 Well, I think maybe six truckloads of already composted manure would do it for now. But I’ll put it on other things too. Oh… Well, I need all I can get really. I need lots. Well, if I can get maybe six or so S-10 loads for the garden…for now…then you can get me some more. Oh, you want to know when you can stop? That would be never. I’ll take whatever you are willing to go get for me. Just get me a load every chance you can. I want it all! Ha ha ha… I’m working with red clay mud here. I need all the organic material I can get! The old blue ’93 S-10 is faithful and true. The engine purrs like a kitten. Unfortunately, everything else is rusting off around it. The hitch pulled loose from the frame this winter when my husband and my brother were hauling wood out off the back of my Dad’s farm. If only he could take the trailer with him, he could get me the equivalent of four S-10 loads in one trip! My brother-in-law believes it can be welded. We’re looking into that.